The Asian International Arbitration Centre hosted the Asian-African Legal Consultative Organisation (AALCO)’s Annual Arbitration Forum themed Connecting Asia and Africa, Connecting Investment and Alternative Dispute Resolution (ADR): Opportunities and Challenges in Bangunan Sulaiman today. 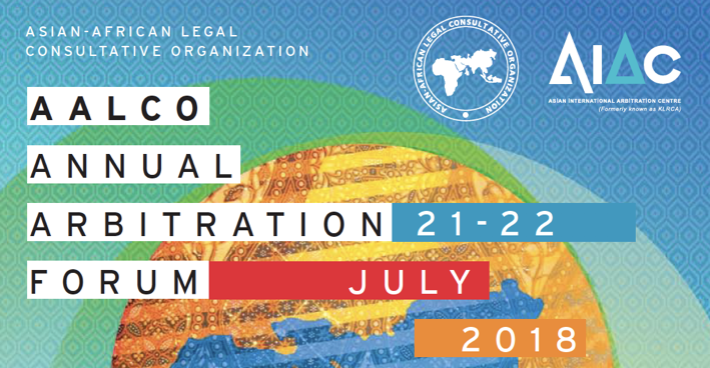 It is the first event of its kind of AALCO’s that brought together all five arbitration centres established its auspices: the AIAC; the Cairo Regional Centre for International Commercial Arbitration (CRCICA); the Lagos Regional Centre for International Commercial Arbitration (LRCSCA); the Tehran Regional Arbitration Centre (TRAC) and the Nairobi Centre for International Arbitration (NCIA). The AALCO is an international governmental organisation comprising 47 member states whoseprimary functions include assisting Member States in drafting constitutions, model legislations and bilateral agreements; appointing and training arbitrators; and overseeing other matters relating to arbitration. AIAC Director Datuk Professor Sundra Rajoo and AALCO Secretary-General HE Dr. Prof. Kennedy Gastorn opened the forum by delivering their Welcoming Remarks; followed by the Inaugural Address by the Honourable Chief Justice of India Dipak Misra; Special Addresses by the The Honourable Professor Palamagamba John Aidan Mwaluko Kabudi, Minister of Constitution and Legal Affairs of Tanzania, YB Datuk Liew Vui Keong, Minister in the Prime Minister's Department (Law) of Malaysia, Professor Dato’ Dr. Rahmat Mohamad, Eminent Persons Group of AALCO; and the Keynote Address by Court of Appeal Judge of Malaysia YA Datuk Nallini Pathmanathan. His Excellency later shared his insight on “Arbitration and International Trade and Investment Law: A Quest for Institutional Convergence Amid Interacting Regimes”. Spanning across two days, the conference touched on the role of the AALCO arbitration centres in facilitating investment and promoting the use of ADR across Asia and Africa, the opportunities and challenges that lie ahead, as well as provided a practical guide for investors venturing into business in different regions across Asia and Africa. Region-specific break-out sessions on the contemporary developments in ADR in Asia and Africa were also organised to shed some light on current affairs. The forum will also see panel discussions on the opportunities for investment and dispute resolution through ADR mechanisms, the paradigm shift from regional trade agreements to cross-continent agreements between Asia and Africa, and the harmonisation of related legal regimes.